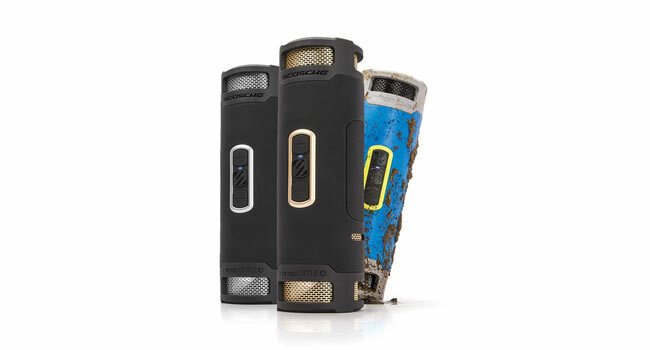 From Scosche Industries, the BoomBottle+ is a new, rugged way to think of a Bluetooth speaker. Welcome to the shape of amazing go-anywhere sound and indoor/outdoor music versatility captured in the latest member of the award-winning BoomBottle family, the rugged, waterproof, wireless, BoomBottle+ portable speaker. This rugged beauty includes exceptional features like two 50mm high-quality speakers, dual pairing for true stereo sound, switchable equalization (EQ) for sound enhancement outdoors and a powerful, internal rechargeable battery for you to charge your mobile devices from the speaker. But wait, there’s more! With its 6200mAh rechargeable battery, you’ll enjoy up to 15 hours of continuous music. With BoomBottle+, you can quickly charge up your smartphone, tablet or other mobile device while enjoying you music via the 2.1A USB charging port. Continuous use time: Up to 15 hrs. Charge time, internal battery: 3 hrs.